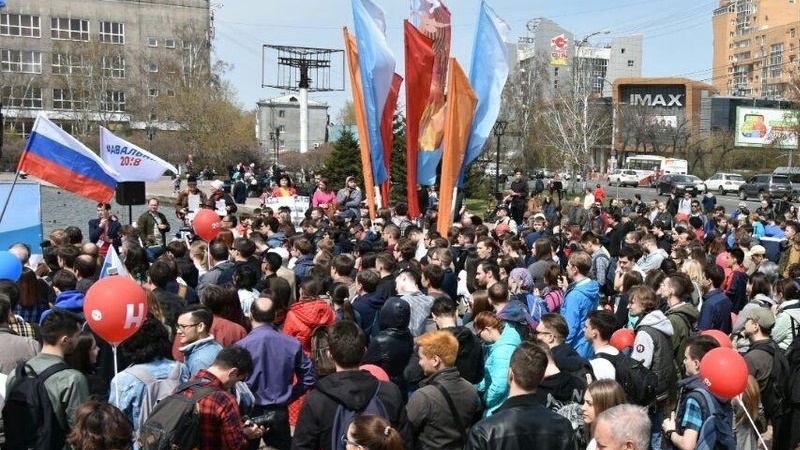 Today, on May 5, supporters of the Russian oppositionist Aleksei Navalny started protest actions in the Russian cities entitled "He Is Not Our Tzar". According to the Russian media, the protests are held in Vladivostok, Yuzhno-Sakhalinsk, Khabarovsk, Tomsk, Barnaul, Irkutsk, and Chelyabinsk. The rallies are timed to the inauguration of Vladimir Putin as president of the Russian Federation, to be held on May 7. Users of social networks share their impressions and publish photos from protest actions. But the city of Krasnoyarsk has finally showed itself. I am so proud with everyone who came out today. Friends, be sure that Russia will be free!" The network user Yana Gerasimova wrote. Activists report numerous arrests and detentions. Activist Oleg Snov reported that the coordinator of the Navalny movement headquarters in the city of Tomsk Ksenia Fadeyeva was detained during the rally “He Is Not Our Tzar”, holding of whish the authorities of the city were trying to prevent but failed. Navalny's headquarters published a photo of the detention of protesters in Krasnoyarsk. The Russian activist further reported about detentions in Chelyabinsk. Meanwhile, in Moscow and St. Petersburg the supporters of Navalny are holding rallies not coordinated with the authorities. Head of the Department of Regional Security of the Moscow Government Vladimir Chernikov said that calls for participation in an unsanctioned rally are regarded as provocation. Earlier, April 30 a rally "For free Internet" was held in Moscow. Its participants opposed the blocking of the messenger Telegram in Russia. According to the calculations of the organization "White Counter", more than 12 thousand people came to protest.